Bogor Agricultural University students of Vocational School Communication Expertise Program (SV-IPB) held the Bogor Food Truck Festival 2018 #StreetFoodEdition at the field of Baranangsiang Campus IPB, Bogor (2/12). Raising the theme "Sunny Vibes Tasty Bites", they present the Republic of Food Truck, Food Blogger Shely Che to chat about food, Sugarspoon, ACP and Family and Friends as well as various foods sold at available stands. In addition, there are also koro bean cooking competitions as a main course, eating competition and photo contest. "This activity is expected to be able to introduce food from food trucks and various snacks to the surrounding community. 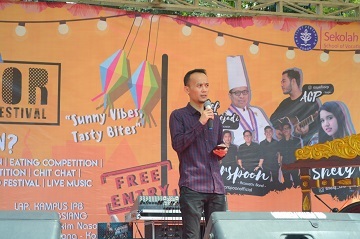 In addition, this is also an opportunity for food lovers to explore ideas and make efforts in the culinary field," said Adam Adjie as the event director.